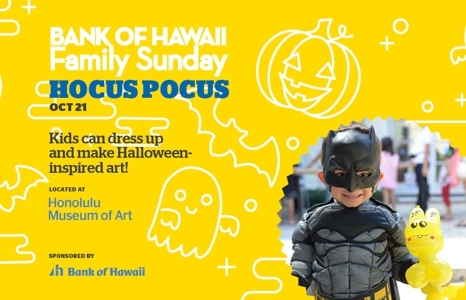 Kids can dress up and make Halloween-inspired art! • Unicorn Costumes: Kids can make their own unicorn tails and horns with ribbons and sparkling fabric. • Halloween Lanterns: Kids can use tissue paper to create a Halloween scene around a plastic cup. Place an LED tea light inside to light up the night! • Silent Disco: Join Miranda from Hawaii Dance Bomb in the Education Lecture Hall, grab a pair of headphones and get your groove on! • Magic with Harvey Ouchi: 10:45 + 11:45am. Head to Central Courtyard to see what tricks Harvey has up his sleeve, or try to catch him around the museum. Enjoy our full-service Sunday brunch menu at the Café from 11am-2pm. Reservations are recommended: 808-532-8734. 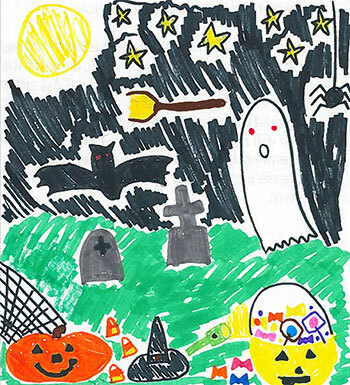 Congratulations to last month's winner, Cheryl Tamura, age 7, from Mānoa!